Birding Is Fun! : One-a-Day eBird Challenge - How are you doing? 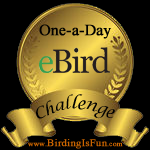 Robert introduced the One-a-Day eBird Challenge a year or two ago. Since then, I have made submitting an eBird checklist a top priority each day. I submit checklists from my yard, gas stations, grocery store parking lots, state parks, etc. You get the point, right? It's not hard to submit one checklist each day, especially with BirdLog for iOS and Android. BirdLog is a necessity and should be on every birder's smartphone. Check out Robert's review of BirdLog here. Here's a piece of motivation from Robert about eBirding (One in which I agree one hundred percent!) - "Yes, it's true. eBirders are better than plain ol' ordinary birders. If the truth hurts and you're asking "Why should I use eBird?" Well then click here." Anyway, here's how I'm doing for the year. I've submitted 749 checklists, which averages out at 3.37 per day. 541 of those checklists were submitted via BirdLog for iOS. I've submitted at least one checklist in 11 different states and 52 counties. 396 species have made their way into my checklists and I've tallied 1036 ABA Area Total Ticks thus far. With 143 days left in the year, I think I can hit 1000 checklists. I'd like to hit 420 species for the year, which is definitely possible because I've only seen a couple of eastern warblers so far. Plus, you never know what may show up on the coast! A Bar-tailed Godwit just showed up in Virginia. What's next? Any guesses? This Tropical Kingbird was just one of my many ticks this year. Digiscoped with an iPhone 4S + Celestron Regal 80 F-ED & Phone Skope Adapter. Check out Robert's review of the Phone Skope Adapter here. Tropical Kingbird at Ahakhav Tribal Preserve. iPhone photo by Tim Schreckengost. It doesn't take much effort to submit a checklist each day. I think all of Birding is Fun's Followers can partake in this challenge. How are you doing? Let us know in the comments! I'm doing great - though not as good as you are but that's okay too. Thanks for the reminder of the importance of keeping track. No problem! Thanks for submitting bird observations to eBird and for following Birding is Fun! We have an on-line reporting system which also links to a Birdline in Australia, and I try to submit lists whenever I am out and about, which is most days. We can also use a tick box with a little added information and it is automatically sent to BirdLife to keep the Atlas of Australian birds up to date. I wonder if it could be linked to eBird as well - will try to find out. Horribly. Life got in the way of birding for most of June and July, so I'm on pace to barely get 365, much less the 500+ I was shooting for. I'm still proud of last year, though. I posted my own version of Robert's one-a-day challenge and one of my new-to-birding friends ended up making his underbirded county in Wisconsin the most-improved in the state for checklists from 2011 to 2012. As for me, a thousand lists in 2014? I'll do it or die trying. And based on some of the birding mishaps I've had, the latter is entirely possible.